Lin-Manuel Miranda addresses the audience of Hamilton after the play’s opening night on Broadway on Aug. 6, 2015, in New York. Photo illustration by Slate. Photo by Lucas Jackson/Reuters. Welcome (back) to the Scorch! It’s the fourth and final round of this year’s Movie Club, and it still feels like there are a million things I haven’t done. But just you wait (just you wait). Mark, I’m so thrilled that you (and Immortan Kois) mentioned Hamilton, because I may or may not have spent the last 24 hours obsessively thinking about what the (inevitable) movie version of Lin-Manuel Miranda’s barnstorming musical might look like, and I’m obviously not the first to have fallen down that particular rabbit hole. And I really like it down here! For those of us who haven’t had a chance to actually see the show—I’m going in February!—listening to the cast recording with eyes closed is kind of like having access to an unrealized screenplay, and I’m free to direct my own version of it in my mind. And in my mind (if you’re reading, Mr. Miranda), the silver screen Hamilton adaptation plants the soul of the show into the body of Paul Schrader’s florid and flowing Mishima: A Life in Four Chapters. The best biopic ever made, Mishima vivisects its subject with the same sort of ecstasy with which Miranda has reanimated another revolutionary, and the high artifice through which Schrader collapsed the various chapters of Mishima’s life could help sustain the fluid beat of the Broadway hit. 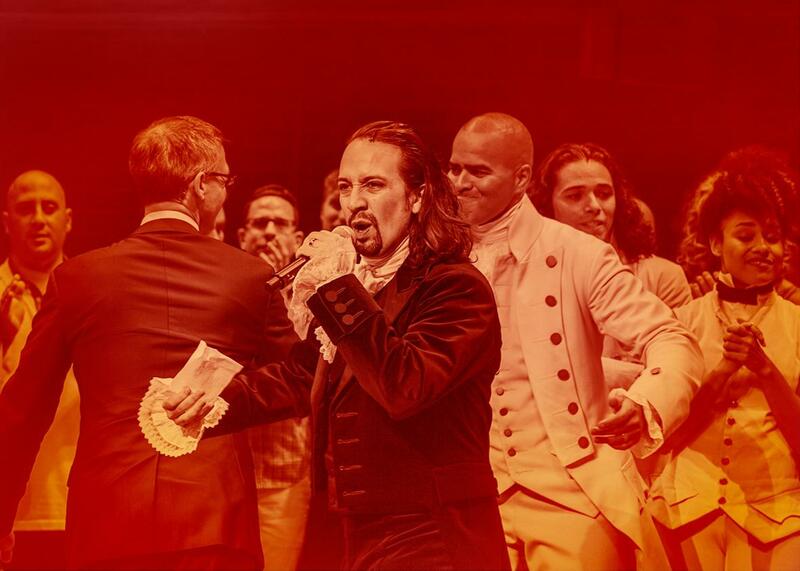 Hamilton is always on the move, and a movie about him would have to avoid getting bogged down by too many set pieces in order to sustain a constant sense of striving and discontentment. It would also have to blister with the headstrong zeal and foolhardiness of youth; it would have to be directed by a mind at work (work), someone who understands that genius doesn’t temper precociousness so much as it ignites it. It would have to be directed by a true renegade, someone who understands what it feels like to rise from the gutters to greatness, someone who isn’t afraid to risk his life for the sake of his pride, someone who … oh, crap, I think it would have to be directed by Kanye West. Hmm. Dana, I think I regrettably have to agree with you: 99 versions of the Hamilton movie out of 100 miss all their shots. On the other hand, as a wise woman named Eliza Schuyler might sing: “Look around, look around, at how lucky we are to be alive right now.” The movies of 2015 didn’t need any help from Broadway to serve up a meaty revue of terrific music, and many of the year’s best films found novel ways to incorporate and transform songs that many viewers already knew by heart. Sion Sono’s cheeky Tokyo Tribe even gave us a rap musical of our very own! And the beat goes on—Mia Hansen-Love’s miraculous Eden was an epic chronicle of France’s electro scene that used the droning inertia of its music to paint a portrait of a guy who’s held hostage by a beat that only he can hear. That film was entirely sound-tracked by pre-existing tunes (as well it should have been), but a number of indies proved that smaller films can sound as provocative and uncompromised as they look. In the Zellner brothers’ indelible Kumiko, the Treasure Hunter, Austin indietronica outfit the Octopus Project were given the task of threading the needle between Fargo and Aguirre, the Wrath of God, and their unsettlingly seductive score somehow managed to pull that off. This is also where It Follows merits a mention, as the seedy dread of Disasterpiece’s relentless soundscape helped the year’s best horror film to balance the deadly threat of its evil with the perverted sleepover vibe of its setting. On that note, perhaps it’s fitting that the year’s scariest film (an honor that’s seldom awarded to a horror movie), was also the one that featured the most disquieting use of music. Roy Andersson’s A Pigeon Sat on a Branch Reflecting on Existence was the third and final installment of the morbid Swedish master’s “trilogy on being a human being,” and Andersson once again led us laughing to the slaughter. The climactic scene is a colonialist nightmare in which slaves are led into a massive wooden instrument that, when rotated on a roasting spit, turns their screams into gorgeous organ music. Andersson, as the chorus of Hamilton might sing plaintively in the background, “is working through the unimaginable,” reconciling the best and worst of life on Earth by refusing to pretend that the two are at all inextricable. Watching A Pigeon Sat on a Branch Reflecting on Existence, I didn’t know whether to laugh or cry, but I have a hunch that Andersson is less interested in moving his audience than he is helping them to locate their place in the grand scheme of things—you’ll know where you are by the end of this movie, even if you’re not crazy about the view. Among the very few films that I treasured even more last year was one that took Andersson’s big picture concerns and flipped them on their side, focusing on time rather than scale. The x-axis to Pigeon’s y, Don Hertzfeldt’s ineffably brilliant World of Tomorrow is barely 16 minutes long, but I’ve watched it so many times that it might as well be Out 1. It begins with a 4-year-old girl named Emily, who may be—per Hertzfeldt tradition—a quivering stick figure, but she’s got the kind of depth that makes it that much easier to cast Bing Bong to the valley of forgotten things. One fateful day, Emily is zapped into the far distant future by an endearingly inbred adult clone of herself and taken on a whirlwind tour of the world to come. From robots writing poetry to cubes in which grandparents can store their consciousness and relay messages to their surviving loved ones (“Oh God, oh holy mother of God”), every detail of Hertzfeldt’s tragicomic vision of doom is held together by the irony that Emily is offered the secrets of the universe, but she’s too young to understand, and too busy enjoying the moment to remember. I first saw World of Tomorrow at the very beginning of 2015, and by the end of the year its ultimate lesson was made real to me in ways that forced me to work through the unimaginable: It’s impossible not to take certain things for granted, no matter how intently we remind ourselves to savor them. The unbearable lightness of being is the only thing that gives any weight to the moments that make our lives. But sure, Sanjay’s Super Team, enjoy that Oscar. So to Dana, Amy, Mark, and even Dan, I say live well and live broadly. You are alive and living now. Now is the envy of all the dead. And if that doesn’t do it for you, there’s a new Coen brothers movie coming out in like three weeks, so I think we’re all going to be OK.